A contra-flow bus lane at Dublin’s Camden Street towards Rathmines does not go far enough to fix all of the issues caused by the one-way gyratory system, the Dublin Cycling Campaign has said. While cycling campaigners have been pushing changes to the gyratory (a one-way system of streets around a block of building) for years, a contra-flow lane has finally been put in place to limit the affects that utilities works for the Luas Cross City tram route will have on buses. People cycling in many directions will be still required to cycle around the gyratory — which often means dealing with fast-moving traffic while crossing over two or three traffic lanes. Dublin City Council distanced itself from the report last year, but the draft NTA plan goes into a large amount of detail on how it “links directly” with council’s published development plan, policies and plans for city. 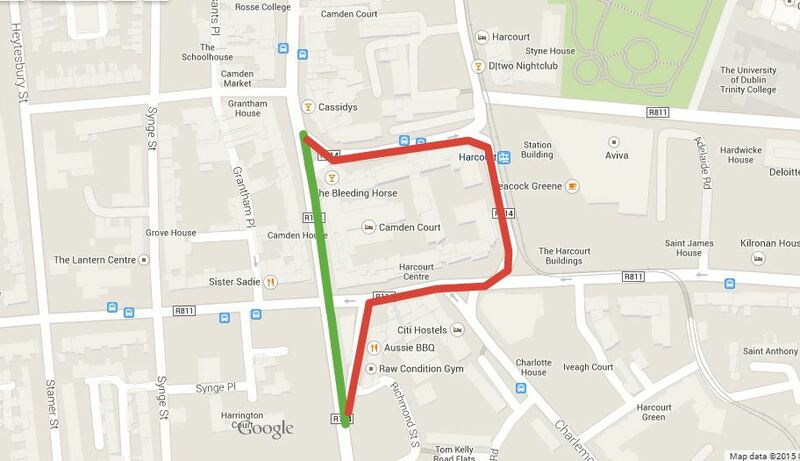 The Camden Street contra-flow lane is linked to the Luas Cross City tram line construction. As we reported last year, the construction will mean 40 extra buses, per hour at rush hour, will soon be diverted away from the tram route and onto the Camden Street to Dame Street route. The Dublin Cycling Campaign said it had “some concern about mixing so many buses with so many bikes on the corridor”. The campaign said: “It is essential that the drivers of the buses pay special attention to cyclists on this route – and, of course, essential that cyclists ride assertively and sensibly (by, for example, adopting the control road position while using the contra-flow lane). Overall though, we are optimistic that after everyone gets used to the new road layout, the new direct route out of town will improve life for those cycling in the city.